Each owner who faced repair has to think about which floor to choose. Of course, you can give preference to all known and boring people for a long time - linoleum, ceramic tile, carpet. But this may be quite a banal solution to the problem. After all, about 90 percent of “repairmen” acquire them, forgetting to ask about the latest innovations or at least become familiar with the “pluses” and “minuses” of the coatings they know. So once again lay aside laminate (at fairly attractive prices), parquet (which is representative of the most environmentally friendly outdoor materials), cork (able to acquire its original shape after deformation), and the appearance of the interior is not impressive . 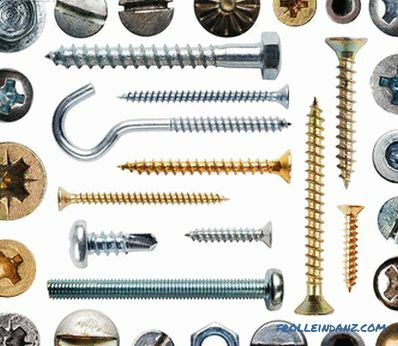 But the result of the repair may be much more original, if you wisely use the existing innovations of the construction market. And by the way, today there are a lot of them. When confronted with the choice of flooring, it should be remembered that in different spaces in terms of their functions, different materials should be used. For example, the same should not be the floor in the room for children and in the corridor - the functions of these spaces are too different. So, what kind of flooring materials does the market offer us today, in what type of premises is it most appropriate to use them? Next, we will talk about both the usual options for all of us, and rarely used exotic. Considering floor coverings for a house, we will talk about materials that it is advisable to use inside the house, and not in household buildings like the garage, barn, etc. The focus will be living rooms and spaces of economic nature (bathroom, kitchen, etc.). And we should begin by considering the individual characteristics of the premises. Hallway is the first room where everyone who comes to the apartment gets to. This is where most of the dirt, dust and sand that mechanically damage the floor covering settles. So it turns out that the material used in the hallway should be durable, resistant to moisture, do not deliver much effort during cleaning. The toilet and the bathroom , where contact with the liquid is never excluded, require a wear-resistant floor covering with increased resistance to water, the cleaning process should not be a hassle. Here the material on the floor, like a sanitary unit, should be durable and resistant to water. But this is not enough! Both dirt and oil and fat should be removed easily and simply from it. Balcony / Loggia requires the use of durable flooring that is resistant to temperature extremes. These characteristics are quite sufficient if the balcony is converted into an additional room and represents a heated part of the space. In the absence of glazing, it is advisable to put on the floor materials that are resistant to the effects of precipitation. Examples: tile, stone. The nursery has requirements for the floor covering that are characteristic of both the living room and the bedroom at the same time. So, the material under the baby feet should be environmentally friendly, durable, ergonomic and, very importantly, safe in terms of the possibility of injury. In addition to the characteristics characteristic of floor coverings used in premises of different purposes, there are general requirements: ease of installation and reasonable price. In order to understand in which space of an apartment the material of which plan would be most appropriate, one should first get acquainted with the existing types of floor coverings, their positive and negative characteristics. 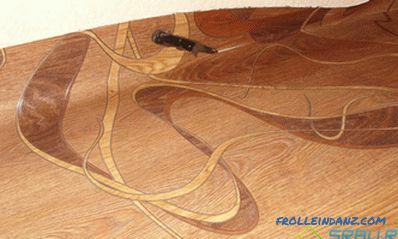 The technologies developed by specialists allow to produce various types of flooring. What are the main characteristics of each type? Where is the most appropriate use of all of the above? So, everything in order! It is made of softwood, after laying the floor is painted or varnished to protect the material from abrasion.With a certain time interval, the decorative coating layer needs to be updated. + Advantages: ecological purity, durability (due to the applied protective layer). It is also worth noting that it is enough to care for the plank floor. - Disadvantages: it’s not easy to cover the floor with quality boards. Only an expert can cope with it. As for the variety of design, the choice is very meager! This is what glued flooring looks like. The production technology of laminate is the processing of MDF panels with special resins, followed by gluing the paper layer to them. Then the resulting "semi-finished product" is pressed (this process takes place at a high temperature) and varnished. Depending on the MDF panels used, the laminate is obtained with different strengths. This criterion is the basis of the classification, according to which material is selected for installation in various types of rooms. So, for living rooms the use of laminate of lower, 21-23 grades is most appropriate, and for corridor and kitchen material of 31-33 grades will be most appropriate. + Benefits: fits very easily. If desired, this task will cope any. 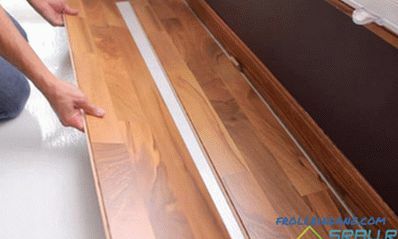 It is enough just to get acquainted with the rules of laying, the material can help you with this: "How to put the laminate correctly step-by-step instruction". 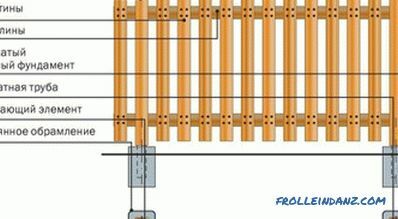 It is possible to connect panels in the glue or beskleevy way. 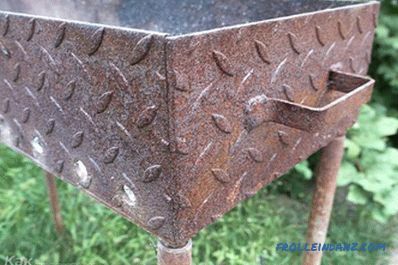 The first option allows you to create a more durable structure, however, to disassemble it is no longer possible. The second option allows you to create a disassembled coating, which gives a chance to replace one of the panels in case of damage. 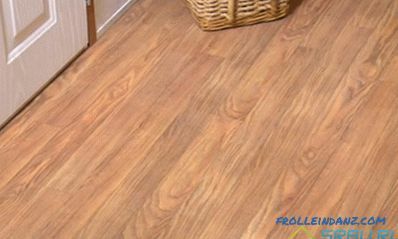 The laminate is always coated with an antistatic coating, which greatly simplifies the process of caring for the floor. Design solutions of this material have a huge variety! - Disadvantages: low environmental friendliness (this is due to the use of resins, impregnations and varnishes in production), instability with respect to water , poor ergonomics, durability depends on the class of laminate. 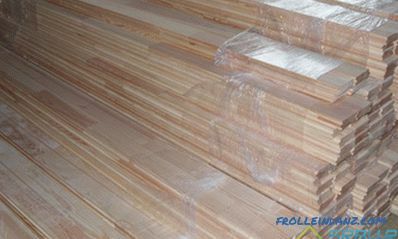 The most wear-resistant are high grades, which can not affect their price. In the process of producing parquet boards, a layer of valuable wood from 3 to 5 mm thick is glued onto the wooden base. Installation of such a floor covering can be done in one of two ways. The first is similar to the method of laying laminate on glue, the second is gluing boards to the base. Parquet is a separate small plank. They are laid in a mosaic and fastened with the help of a bridge on a previously prepared base. + Benefits: environmentally friendly and durable. 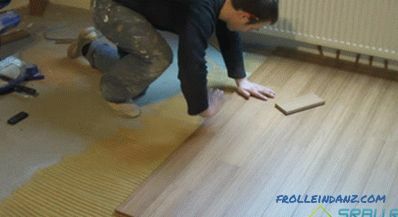 Like many modern flooring, easy to install, easy to clean. - Disadvantages: limited design (all variety is represented only by the type of natural wood). Linoleum can be found on sale in the following forms: sheets in rolls (width from 1 to 6 meters, thickness 1.5-5 mm) and in the form of tiles, so-called PVC tiles . Laying linoleum produced by sticking with special adhesives. The laying surface must be carefully prepared. By the way, as the main component component of this material can be: rubber, alkyd resins, nitrocellulose, and most often - polyvinyl chloride. + Advantages: it is quite simple to mount the coating, loyal requirements are imposed on the base, it is very easy to clean, the design is very diverse, absolutely all types of this material are moisture resistant. Good linoleum is also characterized by resistance to wear. - Disadvantages: low ergonomics and environmental friendliness. A relative of the carpet. The basis can be laid as natural and artificially synthesized components that can repel dirt and characterized by long service life. 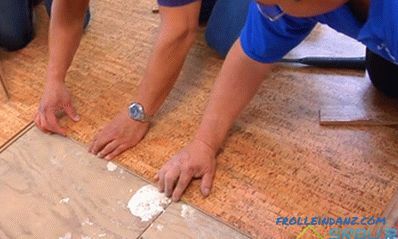 The form of release and method of installation are similar to linoleum. + Benefits: is easy to install, is ergonomic and safe, the choice of colors is very large. If we talk about the carpet based on natural ingredients, it is also environmentally friendly. - Disadvantages: is short-lived, it is not resistant to moisture, and causes difficulties when cleaning the room. Synthetic carpet is characterized by low environmental friendliness. Carpet and an example of its joining with other coatings. More and more fans are becoming tiles.Put it on a special glue, and as the basis is a concrete screed. + Benefits: durability, environmental friendliness, moisture resistance, ease of operation. - Disadvantages: the installation is complex, it requires certain skills and experience; high injury risk. Ceramic tile and its laying process. Produced from natural ingredients. Among the main components are flax, hemp and jute fibers. As additional substances are: vegetable oils, wood flour, resin of conifers and others. Even dyes for the production of this flooring are applied exclusively natural. The release form is similar to rolled linoleum or laminate panels. + Advantages: does not cause difficulties during installation, does not impose special requirements on the base, has a long service life, and is highly resistant to water. Does not cause trouble when cleaning the room. What is very important is a purely natural material. - Disadvantages: a sufficiently hard surface, which hardens even more with time, provides a high level of risk of injury. Marmoleum and its styling process. The main components of liquid floors allow you to divide this coating into: polyurethane, epoxy, methyl methacrylate and cement-acrylic. Among the above, the most environmentally friendly are cement-acrylic, but epoxy floors have the greatest choice in design. The most rarely used are methyl methacrylate, as they are the most expensive. + Benefits: durability and environmental friendliness. Resistance to water and, importantly, to substances such as oil, chemicals, organic solvents. It is not difficult to care for liquid floors. - Disadvantages: low ergonomics and demands on the base during installation (it should be as flat as possible, clean, dry). 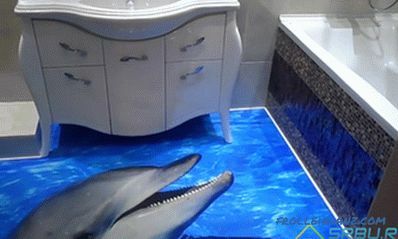 An example of the implementation of a 3D liquid floor in a bathroom. This is nothing more than veneer or pressed crumbs of cork bark. 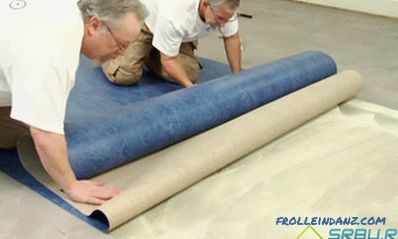 Adhesive floors (sold in rolls, plates) are glued directly to the base; The floating ones are represented by MDF sheets, on which a “cork” layer is glued in during the production process, these sheets simply fit. + Advantages: good sound insulation, environmental friendliness (due to the underlying natural materials); big variety; ease of care. It is worth noting a very unusual characteristic - the ability to restore its form of deforming effects. Laying floating floors is quite simple. The advantage of the adhesive coating is increased water resistance. 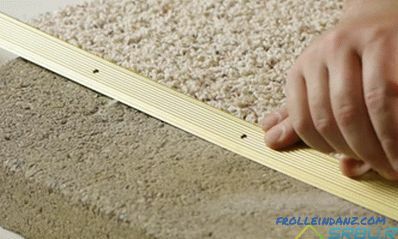 - Disadvantages: the floor covering with an “adhesive cork” can cause certain difficulties; it is necessary to level the base carefully for them; The negative characteristic of floating floors is the low level of moisture resistance. Cork flooring and the process of its installation. When deciding which coating is best to use in a particular space of your house / apartment, you need to analyze what characteristics the floor should have and choose the most suitable material according to its properties. The floorboard is suitable for spaces of almost any purpose. But you should not put it where contact with water or high-humidity air is possible. Under such premises fall: balcony, corridor, kitchen, bathroom. Laminate is also used in spaces of various purposes (an exception is the toilet / bath). The question at his choice consists only in what material of a class will be the most acceptable. For rooms such as a bedroom, laminate 23 is quite suitable; for the hallway, living room, dining room below 32 it is not recommended to use! It can be safely used in children's rooms. Linoleum , despite all its versatility, in the bedroom and child try to avoid. As a rule, it is used in the hallway, in the kitchen, in the dining room. Carpet based on natural ingredients is perfect for a nursery, but synthetic is mainly used in offices and classrooms. The tile is an amazing option for use in household premises - a bath, a toilet, often used in the kitchen. Marmoleum can be used in rooms of almost any purpose, but gradually increasing stiffness excludes material from the list recommended for children. 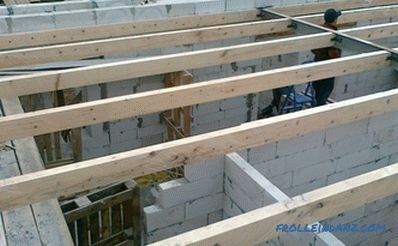 Self-leveling (liquid) floors are actively used in economic spaces. Perhaps their use in the living room or dining room. Modern floors with three-dimensional image allow you to create an original and unique design. Cork floors are suitable for premises of any purpose. Even in the nursery, they can replace carpet. As for the corridor and the bathroom, this coating is not recommended to use in them! Of course, the choice of a particular material depends on personal preferences and the thickness of the wallet. But having information about what kind of flooring for an apartment today is generally available, knowing their characteristics and giving free rein to the imagination, you can create a special atmosphere. Believe me, seriously approaching the choice of material for the floor, a unique repair result can be guaranteed.